<h2>Decoding the honeybee dance could lead to healthier hives</h2><br /><p>It’s part of a field of work looking at insect neurology which is helping to unravel the complexity of their brains.</p> <p>Bees have evolved a unique, and ingenious, way to communicate with each other – the waggle dance. By shaking their abdomens in a particular way, a bee can tell others in its hive the specific direction and distance of a food source or a new site for a nest.</p> <p>‘If nectar or pollen is in the direction of the sun, a bee will run a figure of eight that is orientated towards the top of the hive. If pollen is found 90 degrees from the sun they will point that way instead,’ explained Dr Elli Leadbeater, a bee expert from the School of Biological Sciences at the University of London, in the UK.</p> <p>The longer the bees spend dancing corresponds to the better quality of a food source, while the more time spent on each figure eight represents the distance from the pollen or nectar.</p> <p>Researchers now believe that decoding this information-packed dance further could reveal a link between bees’ brains and how the surrounding environment affects them. In a project called BeeDanceGap, Dr Leadbeater is working to identify the exact genes in the bee brain that play a role in helping the insects understand this waggle dance.</p> <p>To do this, researchers must first identify the best dancing bees in a test hive and watch them as they reveal a food source to other worker bees. The newly educated bees are then captured as they leave the hive so their brain tissue can be genetically analysed to determine which genes associated with learning and memory were activated from following the waggle dance.</p> <p>Only a few individuals are used in this way and the genetic data provides a deep insight into the neurology of a bee’s brain – at a time crucial to their future.</p> <p><strong>Collapse</strong></p> <p>Beekeepers around the world have reported that many of their bees leave and never come back, causing hives to suddenly collapse. Experts believe there are several factors contributing to this widespread loss of bee colonies, including climate change,&nbsp;<a href="https://horizon-magazine.eu/article/smart-beehives-and-heat-treatments-could-protect-bees-decline_en.html">parasites</a>&nbsp;and habitat loss. Agrichemicals like pesticides and neonicotinoids, which are used to kill unwanted insects on farms, have also been strongly linked to the problem.</p> <p>‘The rate pesticides or neonicotinoids are applied to crops don’t necessarily kill bees but they make them worse at foraging,’ said Dr Leadbeater. ‘They get lost or bring back less nectar or pollen. If you do damage to just one part of the brain of a lot of individual bees, it can have huge consequences for the whole colony.’</p> <p> <div class="quote-view quotesBlock quote_horizontal"> <div class="quotesTop"><img src="https://horizon-magazine.eu/sites/all/themes/horizon/images/quotes_top.png" alt="" title="" /></div> <p>'If you do damage to just one part of the brain of a lot of individual bees, it can have huge consequences for the whole colony. '</p> <blockquote><p>Dr Elli Leadbeater, University of London, UK</p></blockquote> <div class="quotesBottom"><img src="https://horizon-magazine.eu/sites/all/themes/horizon/images/quotes_bottom.png" alt="" title="" /></div> </div> </p> <p>Neonicotinoid pesticides have been found to bind to parts in the insect brain, disrupting neural transmission. This leads to some brain cells either failing to develop or not functioning properly.</p> <p>The EU recently banned neonicotinoids, which Dr Leadbeater believes is a huge step forward in protecting bees, but she said governments still need more rigorous ‘long-term environmental safety monitoring’. Without this, there is a risk that other agricultural products used in place of neonicotinoids could impact honeybees in a similar way.&nbsp;</p> <p>But when the first results of BeeDanceGap are published later this year, they could contribute to building better criteria for testing future agriculture practices or products. Dr Leadbeater believes it will provide a new understanding of a bee’s brain, and so help identify problems sooner.</p> <p>The impacts of quickly identifying problems go far further than just supporting beekeepers and their insect charges. Protecting honeybees, along with bumblebees and wild bees, is also essential to maintain a healthy and productive environment. These insects pollinate over <a href="https://ec.europa.eu/food/animals/live_animals/bees_en" target="_blank" rel="noopener noreferrer">80% of crops and wild plants</a> in Europe. According to Professor Martin Giurfa, from the Research Center on Animal Cognition at CNRS in France, ‘preserving little brains is about preserving biodiversity’.</p> <p><strong>More than machines</strong></p> <p>Honeybees have a higher social complexity than many other species. Alongside the waggle dance communication, each hive has a division of labour where different workers have responsibility for a variety of tasks – such as foraging for pollen, nursing the young, building hives and even removing the dead.</p> <p>Prof. Giurfa is co-leading the BrainiAnt project, which looks at how this type of complex social behaviour evolved and how it affected the structure of insect brains. He said that when ‘you understand how bees perceive the world, it is easier to find ways to protect them’.</p> <p>Through the work of researcher Dr Sara Arganda, the project is investigating a part of the insect brain called the mushroom body, where learning occurs and long-term memories are stored. Researchers analysed bee behaviour and gave them memory tests, such as navigating paths using colour cues, in order to learn more about the structure of insect brains.</p> <p>The project strengthened the argument that bee brains are more complex than previously thought. ‘Most findings are saying that insects are more than simple machines, which comes from studies in the honeybee,’ said Prof. Giurfa. '(But) the entrance region of the mushroom body shows a level of complexity and the studies show that this complexity is not rigid, it is plastic. '</p> <p>This means its structure is changing all the time, which mirrors how human brains work. 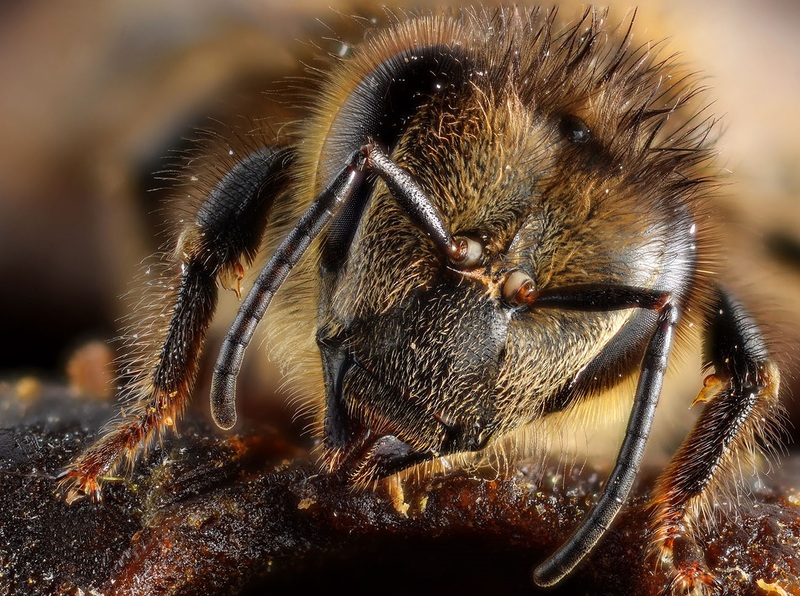 ‘(Bee) brains are capable of sophisticated performances such as learning concepts and rules; they are incredible organs and they need to be defended,’ said Prof. Giurfa</p> <p>To further advance understanding of the mushroom bodies and how they function in different species, the project is being co-led by Professor James Traniello at Boston University in the US, an expert in ant evolutionary neurobiology.</p> <p>Ants, which are related to honeybees, have brains that may be 100 times smaller, and due to their minute size, provide insights into how insect brains are structured.</p> <p>‘What happens to neural tissue at an extremely small size?’ asked Prof. Traniello. ‘Are you losing neurons, are neurons becoming more efficient in their actions, how many neurons do you have to string together to form a circuit that enables behaviours as complex as what you would see in ants? How does the collective intelligence of an ant colony impact the structure of the brain?’</p> <p>If BrainiAnt can answer these questions, it would provide a clearer picture of the evolution and function of ant brains.</p> <p>‘The next step is trying to understand the genes that are involved in regulating brain size, compartment variability, metabolism and other functions,’ said Prof. Traniello.</p> <p>He added that a better understanding of neural tissue could also help to guide attempts to genetically engineer bees so their brains are resistant to environmental threats like neonicotinoids. Although far off, it could mean that bees, and the benefits they bring to the environment, will have a more secure future.</p> <p><em>The research in this article was funded by the EU. If you liked this article, please consider sharing it on social media.</em></p> <p> <div class="moreInfoBlock"> <h3>The Issue</h3> <p>One in ten pollinating insects is on the verge of extinction, and a third of bee and butterfly species are in decline.</p> <p>On 1 June, the European Commission <a href="http://europa.eu/rapid/press-release_IP-18-3989_en.htm">launched a proposal</a> to tackle this problem at an EU level. It includes a new monitoring process to collect quality data and identify trends, action plans to protect insect habitats and incentives for businesses such as those in the agrifood sector, to contribute to conservation.</p> <p>The proposal, known as the EU Pollinators Initiative, has a number of short-term actions to be taken before 2020, at which point the progress will be reviewed.</p> </div> </p> <p><a href="http://bit.ly/newsalertsignup" target="_blank" rel="noopener noreferrer"><img src="https://horizon-magazine.eu/sites/default/files/news-alert-final.jpg" alt="" width="983" height="222" /></a></p> <br /> <img src=”http://www.google-analytics.com/collect?v=1&tid=UA-40077089-1&cid=decoding-the-honeybee-dance-could-lead-to-healthier-hives&t=event&ec=republish&ea=read&el=decoding-the-honeybee-dance-could-lead-to-healthier-hives&cs=republish&cm=republish&cn=republish&cm1=1" /> This post <a href="https://horizon-magazine.eu/article/decoding-honeybee-dance-could-lead-healthier-hives.html">Decoding the honeybee dance could lead to healthier hives</a> was originally published on <a href="https://horizon-magazine.eu/">Horizon: the EU Research &amp; Innovation magazine | European Commission</a>.